The Sandisk ImageMate All-in-One has been around for ages in different types and forms. This is their latest and fastest version to date. First off, don’t mistake this for the older SDDR-289-A20. They do look similar but its redesigned and does now support the UHS-1 cards to the fullest. The reason i’m writing this is because i had such trouble finding a review for it. I wanted to know if it was fast at all since the box or the specs doesn’t reveal anything but the max speed of USB 3.0 (500Mb/s). Ive had a lot of memory card readers in the past and the read & write speed has differed on every single one. 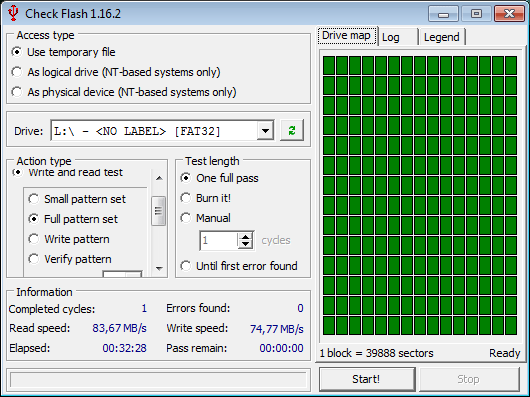 For the test i used a SanDisk Extreme Pro 16GB SDHC UHS-1 95Mb/s and Check Flash 1.16.2. The speeds were really desirable to say the least, its hard to know if its the reader or the memory card that max out at these speeds. The price might seem much ($44, €30, 290SEK) but totally worth it.